RHYS BOWEN: Ann Parker has been one of my long-time friends in the mystery community and we've done many events together. I adore her Leadville historical mysteries, filled with so many real characters and real happenings that you feel you are there. I wonder how many stories start with a found object, or a found photograph? They've certainly sparked ideas for me, as they have for Ann. And what better excuse to collect things in the name of research! Welcome to Jungle Red, Ann. My fascination with historical objects goes waaaaay back, to when I was but a young’un (pre-teen, at least), digging through my grandparents’ basements full of dusty boxes and ancient traveling trunks. I’d marvel over the treasure within: beautiful fans, old tintypes, elegant hats, indecipherable letters written in faded ink, worn buttontop shoes… the list goes on. So, perhaps it’s no surprise that I browse brick-and-mortar antique stores and eBay when doing research for my Silver Rush historical mystery series. From antique stores, for instance, I have obtained a cobalt-blue, gold-latticed “poison bottle,” a magnificent metal clamp for holding papers, a well-used button hook, an old ceramic “cupel” used in silver assaying, and a table crumb brush. 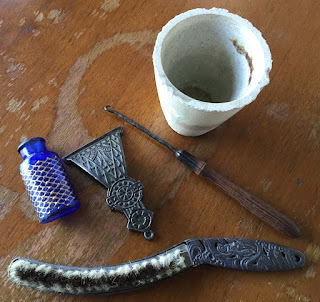 Most of these objects have found their way into my Silver Rush stories, which are primarily set in the silver boomtown of Leadville, Colorado, in 1880. The cupel kept me company as I delved into silver assaying for the first book in the series, Silver Lies. In Leaden Skies, the poison bottle makes an appearance and my series protagonist, Inez Stannert, puts a button hook to good use. 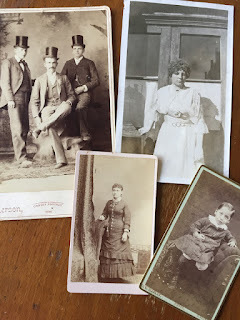 I also scoop up old photographs and cabinet cards that catch my eye, and muse over the anonymous faces. Who were these people, and what are their stories? Sometimes, these people from long ago find a place in my fiction. The three top-hatted gentlemen, for instance, became models for my “Lads from London”—British remittance men, who appear in both Mercury’s Rise and What Gold Buys. Antique stores are dangerous to my pocketbook, and eBay is even worse. My most recent eBay frenzy occurred when I was working on A Dying Note, the newest in my series. 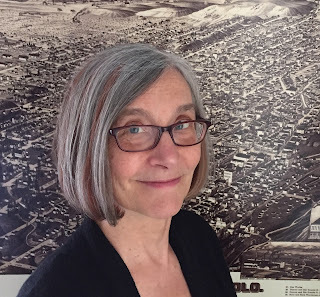 In this book, my protagonist Inez Stannert has relocated from the wild silver-boom town of Leadville, Colorado, to the somewhat-less-wild city of San Francisco, California. It’s now 1881, and Inez is managing a music store, which is quite a bit different from her previous position running the Silver Queen Saloon in Leadville (how this all comes about is another story for another post!). For plot purposes, I needed to get a better bead on Victorian “trade cards” that stores and businesses used for advertising. So, late one night, I turned to eBay, looking for examples from the 1880s. I indeed found examples, including some cards advertising music stores, even some from San Francisco, Inez’s new stomping grounds. But then I also found other cards—one for “Fine Hats” that featured a shoe full of flowers, another touting Coraline corsets, another extolling the virtues of Zoedone (a drink both “stimulating and invigorating, yet non-intoxicating” according to copy on the reverse side), and a card with an impressive image of San Francisco’s Palace Hotel.… Before I knew it, I had clicked “Buy Now” for half a dozen or so. I haven’t found a place for all of the objects, people, or businesses in my collection, but there’s always the next book! Ann Parker authors the award-winning Silver Rush historical mystery series published by Poisoned Pen Press. During the day, she wrangles words for a living as a science editor/writer and marketing communications specialist (which is basically a fancy term for “editor/writer”). Her midnight hours are devoted to scribbling fiction. The sixth book in her series, A Dying Note, is being released this month. Publishers Weekly calls it “Exuberant.... brims with fascinating period details, flamboyant characters, and surprising plot twists.” Visit annparker.net for more information. And your trade cards are lovely; eBay is definitely a source of incredible finds . . . . I have a definite love/hate relationship with eBay! And (confession) I keep going back and looking at more trade cards. I'm thinking maybe a future Silver Rush story might involve a woman's press collective... or maybe I'm just looking for excuses to feed my habit! Oh, dear. I haven't yet succumbed to ebay artifact buying - but now I might have to check it out! You know I love this series, Ann, and can't wait to read the new one, especially since it's set in a city I've spent a lot of time in. Will you be at Malice? I hope you enjoy A DYING NOTE. San Francisco 1881 was all new to me. It was fun to dip a toe in the era. Yes! I'll be at Malice this year. I'll look for you... maybe we can even grab a quick cup of coffee at some point? Oh EBay! That way lies absolute madness! Oh and, I try to stay away… Because there is just everything in the world on eBay, isn’t there? And once you enter the portals… Doomed. But you certainly have found some life-changing things. I wonder how our paths have not crossed in person—Maybe because you are so incredibly busy! And what a joy for you to work with the poisoned pen group. How fascinating that the story come from the objects! Which, in real life, is exactly what happens, right? They are so intertwined. Welcome, and cannot wait to read this! I suspect our paths have taken us buzzing past each other, perhaps close to the speed of light. I *am* busy (will I ever be able to retire from the day job? Do I *want* to retire from the day job?) --but then, aren't we all? I'll keep an eye out for you at the upcoming Malice convention so we can say hello. And yes, I count myself very very lucky to be one of the authors at Poisoned Pen Press. They are amazing folks! Ann Parker, I hope to see you at Malice! Hello Triss! I hope to see you too! It's such a small cozy venue, surely we will run into each other at some point or another. :-) I'll look for you on the schedule! Yes yes yes, see you at Malice! Wonderful! Fascinating objects, with curious and compelling backgrounds. Thank you for this glimpse into part of your process, Ann. And into your mild obsession. I can relate. At one point I searched out some silverware with a particular, historic pattern, and I haunted antique stores looking for it. Why? Who knows. I thought it was pretty, although I never did find enough of it to use for even a small dinner party, and it sat in a plastic bag for decades. That was long before EBay, fortunately. We are in the process of clearing out a small house where my husband and his dad and brothers have had a business for over fifty years. I've found all kinds of ephemera, including, oddly, a pair of spats. My imagination has gone a little crazy, trying to make sense of why they were found where they were! In the attic, beneath a table. I guess if I put them on EBay, someone else might use them as a jumping off point for a flight of imagination of some kind. The buttonhook in the photo triggered a long ago memory, a detail in the book Sybil, about the woman with multiple personalities. She had been tortured by her mother, with a buttonhook, which had "scarred her insides". Ever since I read that--in the 80's?--I've never been able to see one without thinking of that horror. And Sybil, yep, I saw the movie, featuring Sally Fields (I think). I guess the book/movie did their job(s), because I, too, flash on the bit with the buttonhook whenever I pull out the item for show-and-tell. Eeeek! Old things (and old people) inspire me as well, Ann! And the tug of war between collectors and de-clutterers who can end up married to one another. Things trigger memories and inspire new ideas. Congratulations on the new book. Ann, your series sounds right up my reading alley--can't think how I've missed it--will rectify that mistake! One of the things that drew me to archaeology is being able to uncover and touch objects from the past--historic, prehistoric--there's always a sense of wonder in the thrill--and mystery--who was the person who made/used this thing? What was their life like? And don't get me started on ebay! After two years of searching fabric stores, looking at ready-made drapes--I took a chance on some material from ebay and hit the jackpot--beautiful, one-of-a-kind fabric--never tire of looking at those drapes even now. Archaeology, wow! So you are an archaeologist? When I was in third grade, and the teacher asked me what I wanted to be when I grew up, I said an archaeologist! Perhaps all that digging around in my grandparents' basement full of trunks and so on influenced that particular response. :-) Sounds like you and I both mull the same questions re: objects from the past. eBay has absolutely everything, doesn't it! How cool that you found fabric for curtains that you love, even now! I can resist eBay, but antique and junk shops are my downfall. I can still hear Ross saying, "But where are you going to put it?" Therein lies the problem. When you have wonderful little treasures like Ann's, you want to show them off...but there are only so many tabletops, shadow boxes and curio cabinets you can fit into a house! At least ephemera (paper items) are relatively easy to display. Ann, I'm delighted to discover your Silver Rush series. There was so much going on in postbellum America with the Great Expansion in the west and the Gilded Age in the east. Yet there are so few mysteries set in that period! I'm glad to find yours. So glad that I've piqued your interest in my series. I love this period of time in the West, so much change, and (surprisingly to some readers) so much opportunity for women... with more looming on the horizon. A group you might be interested in (if you don't know of them already) is "Women Writing the West." The authors cover a broad swath of time in the U.S. West, but there is a fair number focused on postbellum U.S. West. Welcome to JRW, Ann! How wonderful that you have these wonderful photos. Do you have a family bible with names of your grandparents, great grandparents and other ancestors? When you mentioned finding beautiful fans in your grandmother's attic, it reminded me that I have a beautiful Art Deco purse from the 1920s that my grandmother had. I love historical fiction and I look forward to reading your new book. Thank you for the warm welcome! :-) As for a family bible, nooo... but I have something "similar." It turns out that, through my paternal grandfather, we are distantly related to the DuPonts (yep, *those* DuPonts). Pierre S. DuPont had a strong interest in genealogy, and commissioned a study/project pulling together what would become the "Genealogy of the D'Andelot-Belin Families: 1960-1951." He then had copies made and every descendant (as of 1951 or so) received a copy! I've got the one handed down through my family. It's a treasure trove of names and intriguing bits of family history. For the other branches of the family--grandmothers, maternal grandfather--it's been catch as catch can. I have some info, but very scattered. Ooooh, that Art Deco purse sounds like a wonderful family heirloom. Do you ever use it? Thanks for dropping into JRW, and I hope you enjoy A DYING NOTE. Feel free to drop me a note and let me know what you think of it! Yes, I often use the Art Deco purse when I go to formal events. I think I used it at the banquet at Bouchercon Toronto. That is interesting about your family genealogy. Another question: did your grandmother (s) have cookbooks that they wrote in? I'll let you know what I think of the book when I get a chance to read it. Are they in bookstores yet? And oh, yes, thank you for the reminder about cookbooks! Actually, what I have (and treasure) is a little wooden "recipe box" that holds recipe cards going back about four generations. The oldest cards are short on amounts of ingredients and precise cooking temperatures ("slow oven?" What's that? ), but I cherish them for their endurance, the handwriting, and the evocation of times past. What a great reason for buying stuff. "I'm not hoarding, it's research!" Point 1 - Congrats on the new book Ann! Point 2 - See? This is what I'm talking about when I say Jungle Red is going to be the culprit when I go bankrupt. I HAD to get the first Zoe Chambers novel by Annette Dashofy after you featured the author here. I ordered the first V.M. Burns book after the post on the Agatha nominees and now I'm feeling a compulsion to go buy the first book in this series too. Hank had it right by saying eBay is the way that lies madness, but I think all the great, interesting and intriguing authors and books that JRW features is also another of the "Roads To Madness" (oooh, I got to work in a song title from one of my former favorite bands Queensryche!). As for that eBay connection, I used to have a lot of stuff that I was interested in collecting and that was definitely the best place to go. Nowadays, I'm not really collecting much but I still go there to get cheap CDs to upgrade when one of my cassettes wear out. On occasion I'll buy a book there as well. And I do sell stuff on the site as well. Of course, thanks to Massachusetts changing the law, I had to pay tax on the money I earned for the first time this past tax season. Rotten money grabbers that they are. Ah, research! One of my favorite topics. How lucky you were to have grandparents with REAL STUFF! I sometimes do the NYC Midnight Short Story Challenge, and once I got -- Genre:historical fiction -- Setting: brothel -- item: tiger skin rug. I had a ball and came up with a brothel in Silver Rush Nevada -- the children of the ladies would sit and tell each other stories on a tiger skin rug left by a world traveler. Your books sound delightful! Welcome, Ann, and congrats on the new book! Reading about your series made me wonder, how did you first get the idea to write it? Was it an artifact? A particular interest in that time period? Ah, there is a story behind the story... ;-) Actually, the initial spark came from a bit of "hidden" family history (said history is another obsession of mine). I was in my mid-forties when my Uncle Walt casually mentioned that my paternal grandmother had been raised in Leadville, Colorado. My reaction was "WHAT???" You see, Granny had loved to tell stories, but it wasn't until then I realized that all the stories I'd heard had been about her life as a young unmarried (and then married) woman in Denver. She'd never said boo to me about her childhood nor about Leadville. "It had the biggest silver rush in the world, back in the 1880s. A boomtown with an amazing history," Uncle Walt explained. He suggested I research Leadville and write a novel set there. Thanks for sharing, Ann. Some of my favorite antiques are the ones my husband found while river diving in South Carolina: old Civil War medicine bottles, liquor bottles, apothecary bottles of all sorts. And shark's teeth. Lots of prehistoric shark's teeth. Looking forward to A DYING NOTE! Wow... shark's teeth?? In a South Carolina river?? Very cool! And I love old bottles. What kind of bottles has he found? I'm very curious! And thank you for your kind words re: A DYING NOTE. I hope you enjoy it! Wonderful post. Thank you, Rhys and Ann! I hadn't read many historical novels, but when I had the opportunity to read yours I was hooked. What fascinating characters! And oh so beautifully written. I love my mother's old photos and postcards. I wish I'd known those people. I'm probably one of only a handful of people who haven't' used eBay, but I do love antique stores. Looking forward to your next book. Glad you enjoy the series (which I'm beginning to think of more as a saga these days... ;-) ). The old family photos I have are definitely close to my heart. The old tintypes, especially. Some of the men I've been able to identify by their ears (my paternal grandfather had ears that stuck out... from babyhood to adulthood, so he was pretty easy to track). Other times, I have found enough photos of a single individual to be able to identify him/her through time. Love your "Silver Rush" mystery series... I'm especially fascinated by Inez's new venue San Francisco in 1881. San Francisco history has always been a passion of mine, having lived here most of my life, and lived through what many today would consider "historical San Francisco." I never thought about tangible objects from the past as triggering plot devices for historical novels. But of course they would! I'm guessing that not all (if any?) objects found in antique stores or on ebay would have a verifiable provenance? So how do you verify it's real and not "forged?" And more important, I think, would be how do you know what date the artifact belongs to? I especially LOVE your Victorian trade cards, but your story takes place in 1881... and Queen Victoria lived from 1819 to 1901, how do you know that those particular cards would have been around in 1881? Like the Palace Hotel for instance? Can't wait to read your next Silver Rush mystery!!!! I'm glad you are enjoying the change of venue for the series. I can't leave Leadville (and Colorado) *entirely* behind, but it is fun to explore San Francisco and learn more about her past. As for provenance of objects... well, some is taken "on faith," and some of it is looking at similar items from the timeframe and doing a "best guess." 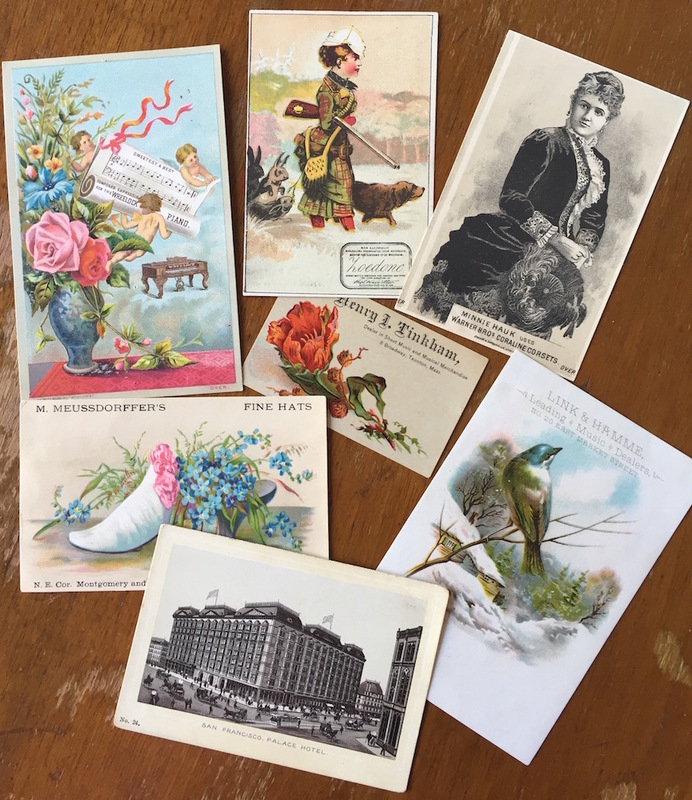 For instance, here's a short history of trade cards that gives some information on when they were popular (https://www.collectorsweekly.com/cards/trade-cards). As for the Palace Hotel, it was built in 1875, and the description on the back of the card dovetails with descriptions written in 1887 (a history of the hotel is here (http://thepalacehotel.org/). So, I can't know for certain that the card is 1881, but I'm pretty sure it's from that general timeframe. Do you find historical museums are also useful (for knicknacks, photographs, inspiration, etc)? Or is the lack of context from an anonymous object more appealing? Do you have much difficulty finding objects from your specific time period? Wow, it sounds like you've found some real treasures in your antique store and eBay shopping. Do you have a favorite item? Hmmm. That's a hard one, Staci. I have a hat-pin from some long-ago relative (not sure which one) that is pretty special. I picked up a lovely 19th century "Ladies Travel Case," with all kinds of nifty little glass containers with silver-plated lids, little hidden compartments including a compartment holding little ivory/bone-handled sewing implements... lots of little items inside. I haven't found a place for it in my books yet. Maybe the next one! Ann, I loved your post and your refections about eBay. I have to admit the photos of the objects and the cards you purchased makes me want to go check eBay out. It's been a while since I have been active on it. It is amazing what one can find there. Items often pop up from there when I'm doing general research. I really enjoy your series. You are a very talented writer. I'm looking forward to what Inez does next in her new adventures in San Francisco!